Alex Sayz: All new website! It´s been a long journey but it's finally finished. 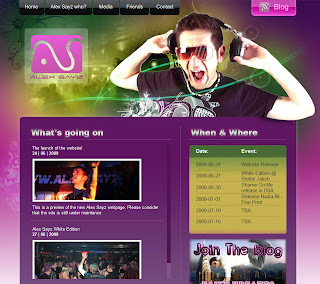 After over 2 months the new Alex Sayz webpage is launched. I really hope and wished that the site would be up before the release of "Shame On Me" in USA and the party on Saturday. We made it! I put a lot of thoughts behind this site and hope you will like it. I collected the best from the past and left a lot of space for the future. You can listen to the classic Sayzsation Mixtape directly from the site and see all of my clips from youtube. Read about me, the latest news and know what exciting things to come. If you noticed i got a brand new logo too. Let's step it up!